READ OUR FISHING BLOG TO FIND OUT WHAT'S BITING RIGHT NOW! 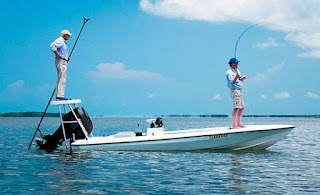 Fishing the beautiful flats of Key West and the Marquesas, you can go Light tackle & fly-fishing for the great game fish of the Gin Clear Flats and Backcountry Basins.Tarpon, Bonefish,and Permit are the main focus but we'll find Pompano, Barracudas, Shark too. Instruction for the beginner.Experience fishing with a seasoned captain. This is my 17-foot ft. custom "Montgomery Brother's" technical poling skiff. There are only eight of these in the world. It's stable, draws almost no water and has a modified "Sidewinder" fiberglass hull built specifically for fly fishing and light tackle sight casting on the flats. The Mercury Opti-Max pumps out 115-horsepower and whisks us to the fish with speed and stealth. Read about me in the Men's Journal.